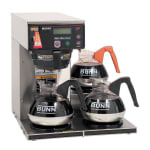 Ideal for restaurants with a high demand for coffee, the Bunn AXIOM-15-3 38700.0002 coffee brewer is equipped with a 200-ounce tank that offers back-to-back brewing capability. It can brew 4.2 gallons of coffee per hour, which creates 67 servings in standard 8-ounce cups. With three decanter warmers arranged in an L-shape, it can keep three pots of coffee warmed to serving temperatures simultaneously. To help your business expand its menu, this model includes a hot water faucet that can be used to make tea, hot chocolate, and even oatmeal. Equipped with electronic features like BrewLOGIC, which helps determine flow rate and adjust brew time for consistency, programming and maintenance of this brewer are easier with front-mounted controls. As an automatic brewer, it requires plumbing for water access, which means it cannot be easily relocated after the initial installation. However, it will not require the manual filling before each pot required of non-plumbed units. It is recommended for a minimum input pressure of 20 PSI and a maximum of 90 PSI. "It is so nice to have a hot cup of coffee again. We love that we do not have to poor water into it to make coffee. Would buy it again! Thank yo..."
"Good discount purchase way lower than Mfg. prices." "Every day for a few and many on weekends"
"It is so nice to have a hot cup of coffee again. We love that we do not have to poor water into it to make coffee. Would buy it again! Thank you,"
"Bought this coffee maker for a group of men that drinks a lot of coffee. Very easy to use and makes a pot of coffee in seconds. I don't drink coffee but the men tell me that coffee taste better, they are a very happy group of men now." "We purchased the Axiom Coffee maker to provide coffee and hot water for approximately 35 persons daily. (It replaces two 12 cup (home use)coffee makers we purchased locally.) 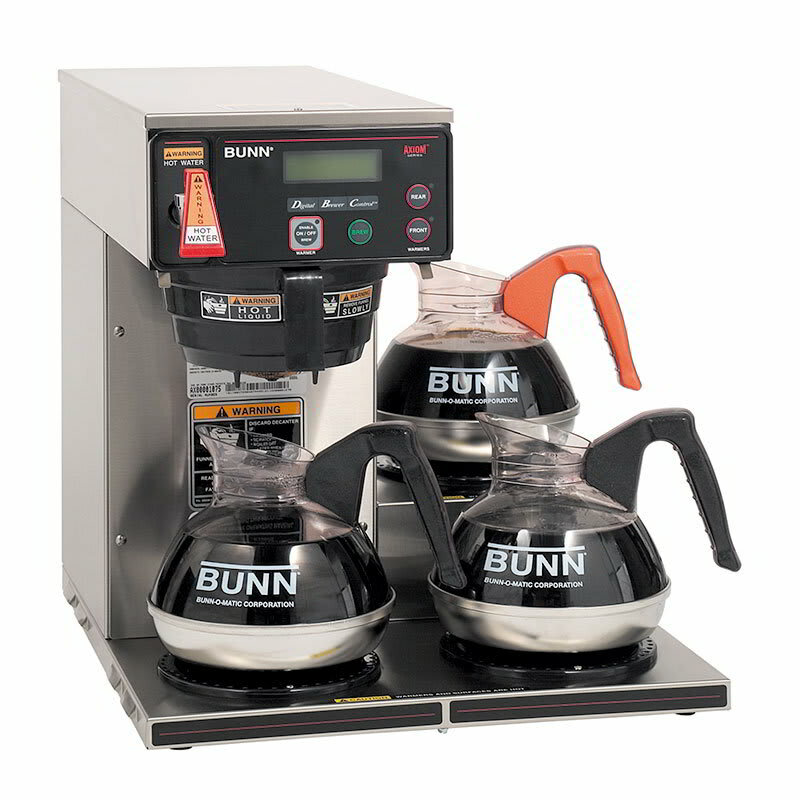 Positives: -Fast Brew Time (compared to 12 cup home use coffee makers) -Burner shutoff programmable based on time -Hot water available instantly -Compact and takes up minimal counter space -Easy to clean -Programmable energy saving feature Negatives: -Wish all three burners had sensors to shut them off before baking the coffee to pot. -The unit makes a noise (not excessive) while metering the water into the unit. We made a good choice."